What to do next for becoming missional. Reggie McNeal's bestseller "The Present Future" is the definitive work on the "missional movement," i.e., the widespread movement among Protestant churches to be less inwardly focused and more oriented toward the culture and community around them. In that book he asked the tough questions that churches needed to entertain to begin to think about who they are and what they are doing; in "Missional Renaissance," he shows them the three significant shifts in their thinking and behavior that they need to make that will allow leaders to chart a course toward being missional: (1) from an internal to an external focus, ending the church as exclusive social club model; (2) from running programs and ministries to developing people as its core activity; and (3) from professional leadership to leadership that is shared by everyone in the community. 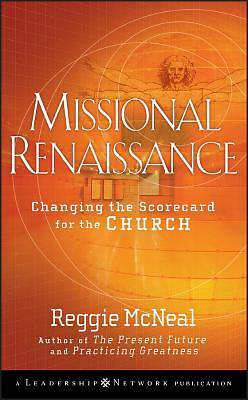 With in-depth discussions of the "what" and the "how" of transitioning to being a missional church, readers will be equipped to move into what McNeal sees as the most viable future for Christianity. For all those thousands of churches who are asking about what to do next after reading "The Present Future," "Missional Renaissance" will provide the answer.